This practical, easy-to-use Navajo dictionary is intended primarily for Navajo children learning to read and write the language in bilingual classrooms. It presents over 1,500 noun and 330 verb entries, all selected because they are words used in and around the school. But the audience for this book has always been larger than just youngsters: it has proven useful for anyone wanting to learn Navajo - adults and children alike. For each of the thirty-six letters in the Navajo alphabet, this dictionary provides first a listing of nouns followed by verbs. For most of the nouns and all of the verbs, an illustration is also included to aid in learning by providing a visual reference. While the dictionary is organized using the Navajo alphabet, the index gives non-native speakers a complete list of all the English translations from Navajo. Originally published in 1983 as part of a Ramah Navajo School Board, Inc., initiative to develop bilingual educational materials in the Navajo language, this book has remained in print and helped an entire generation of students learn Navajo. Its re-publication by the University of New Mexico Press, in cooperation with the Ramah Navajo School Board, Inc., helps fulfill each institution's respective mission of promoting cultural literacy. 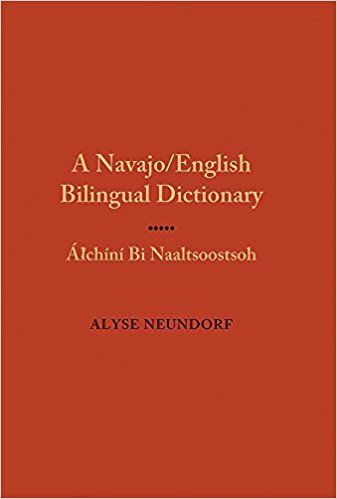 Alyse Neundorf received her PhD in linguistics from the University of New Mexico and devoted her career to the study and teaching of her native Navajo. She was passionate about helping students learn to read and write in Navajo, and she taught at UNM-Gallup until her untimely death in 2004.